Primary Mathematics, Vol 8, Issue 2 Leicester: Mathematical Association, Summer 2004. In the above edition of Primary Mathematics we outlined our view of mathematical enrichment as appropriate for all children rather than just the most able. Enrichment seeks to offer learning contexts that support problem solving and demonstrate an approach to teaching and learning mathematics that sees it as collaboratively constructed by teachers and learners together. How can teachers in ordinary classrooms enrich the mathematics that they are offering to their pupils? Our first suggestion would be to look for enrichment materials on the NRICH website. Whilst we take you through some of the features of the site we will identify some of the resources that relate to pattern - the theme of this edition of the magazine. At NRICH we have been developing access to our huge bank of mathematical problems, games and activities to enable links between them to be made. We hope that this will facilitate children and teachers in finding challenging problems that relate to topics in which they are interested. This will enable to enrich the mathematics to which they have access. We are doing this in a number of different ways: by theming our problems and articles each edition across the whole website, by improving the search mechanisms and labelling systems so that problems and resources at given curriculum levels and on given topics can be found. Each month we now publish three problems designed to be accessible to pupils who have covered the mathematics usually encountered by the end of each Key Stage. This means that there are three problems for those with experience of mathematics at Key Stage 1 (Content level 1), three for those with experience of maths up to the end of Key Stage 2 (Content level 2) and so on up to, and including Key Stage 5. At each level there are three problems: one challenging (*), one more challenging (**) and one very challenging (***). The stars refer to the coding system on the site. We have also gone back over all the past problems in the archive and applied this coding to them, alongside identifying the type of mathematical content used by each problem. These identify curriculum tags that best fit the problem. This means that there should be something for everyone and we hope that you will be able to find it through one of the possible search mechanisms. The language in which the problems are posed is designed to be accessible to children within that level. We try to avoid ''ageist'' contexts to a large extent as many of the problems may well be appropriate for older children, or younger children, for a number of reasons. The levels are designed as indicators rather than prescriptions. To help with this the fifteen problems we publish each month are divided into "tiers" covering two content levels. will result in a list of 28 problems that use the word "pattern" (the tenth of which is called "Odd Squares". Changing the Content type to "ALL" will give a list of 120 resources at this content level. 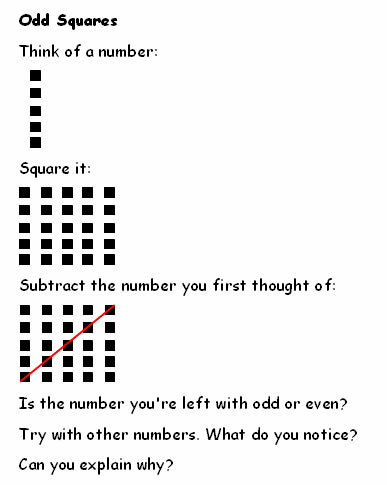 If you square an odd number you get an odd number. And when you take an odd number from an odd number you get an even number. When you square an even number you get an even number. If you take an even number from an even number you get an even number. So for every number the answer must be even. By sending their solutions to us for publication, students take advantage of the opportunity to communicate their mathematics to an audience beyond their classroom and engage in the business of being mathematicians. This problem was labelled content level 2 and difficulty level * which means that the mathematical content is appropriate at Key stage 2 and the problem is not too challenging. Looking below the problem we can see a list of the mathematics content that the problem covers -one of the descriptors (or tags) in the list is "pattern" and clicking on this will take you to all the problems that have been tagged with this descriptor. You will find a list containing nearly 80 problems at level one and two with this tag. A problem you could find in this way is "Up and Down Staircases". Once again this was taken from the May edition and involves generalising which has strong links with pattern and pattern spotting. This time the problem is at content level 1 and difficulty level *. This is an appealing problem because it can be tackled by young children using practical equipment such as Multilink cubes but it also leads them into discovering the number pattern of the square numbers. You might be particularly interested in pattern associated with sequences and to find all the problems about "Sequences" you can click on this tag. 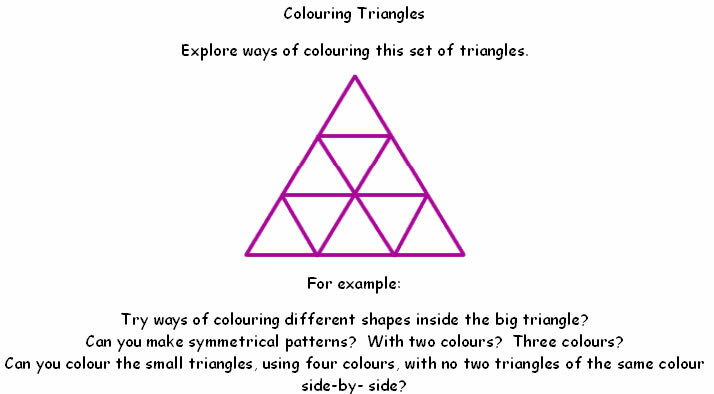 Once again here is a problem that is accessible to young children and offers them a practical activity of colouring in but with a purpose. This is a content level I difficulty level * problem. .We hope this gives you some idea of the possibilities for enriching specific topics with some problems from the website. Hopefully now that SATs are over for another year you may find time to try some of them with your pupils. Do let us know how you get on and remember we are keen to receive good solutions for the current month's problems to post on the website.